Neelkanth Road, Lakshman Jhula, distt. 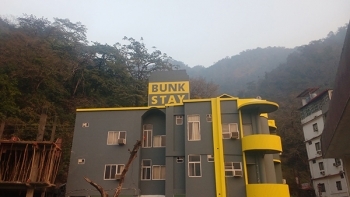 Bunk Stay is a backpackers hostel in Rishikesh. This well budget bunkstay is ideal place for solo and budget travelers visiting the Rishikesh and nearby places. The bunk hostel offers sharable bunk beds dormitories and private rooms attached with modern amenities and facilities. The hostel offers scenic sunset view from rooftop. Along with comfortable accommodation, this bunk stay in Rishikesh provides healthy food at rooftop cafe, yoga, free wifi, garden terrace, transport and clean water facilities. The hostel is located behind Trimbakeshwar temple, famously known as Tera Manzil Temple near Laxman Jhula. The bunk stay offers 4 bed mixed AC/ Non AC Dorm, 4 bed women AC Dorm, 6 bed mixed AC Dorm, 10 bed mixed Non AC Dorm, private deluxe and standard rooms. Each of the dorm and rooms are attached with hot shower bathroom, toiletries, lockers, hair dryer and clean drinking water. The hostel has a rooftop cafe serving traditional Indian delicacies, continental and chinese food with hot & cold drinks. Rishikesh is a yoga capital of India and situated in Uttarakhand state. It is well connected by road and rail. One can reach Rishikesh via bus/ rail/ air from Delhi which is 242 kms. Regular bus service from Maharana Pratap ISBT, Delhi is available. Nearest airport to reach Rishikesh is Jollygrant airport located at 21 kms from the city and connected with bus/taxi service.